Thoroughly dry the chicken with paper towels. Generously season all over with salt and pepper. Heat the oil in a 10-inch or larger skillet over medium-high until shimmering. Working in batches if needed, add the chicken and sear until deeply browned on the bottom, 6 to 7 minutes. Flip with tongs and sear the other side until browned, 6 to 7 minutes. Transfer the chicken to a plate; set aside. Reduce the heat to medium and add the butter. When melted, add the shallot, garlic, 1/2 teaspoon salt, and 1/4 teaspoon pepper and cook, stirring occasionally, until just starting to soften, about 1 minute. Add the flour, stir to evenly coat the shallots and garlic, and cook for 1 minute more. Stir in the half-and-half or milk and broth until no lumps from the flour remain, making sure to scrape up any browned bits from the bottom of the pan. Bring to a boil. Reduce the heat to a simmer. Return the chicken to the pan and simmer until the sauce is thickened enough that it coats the back of a spoon and the chicken is cooked through, 3 to 4 minutes. 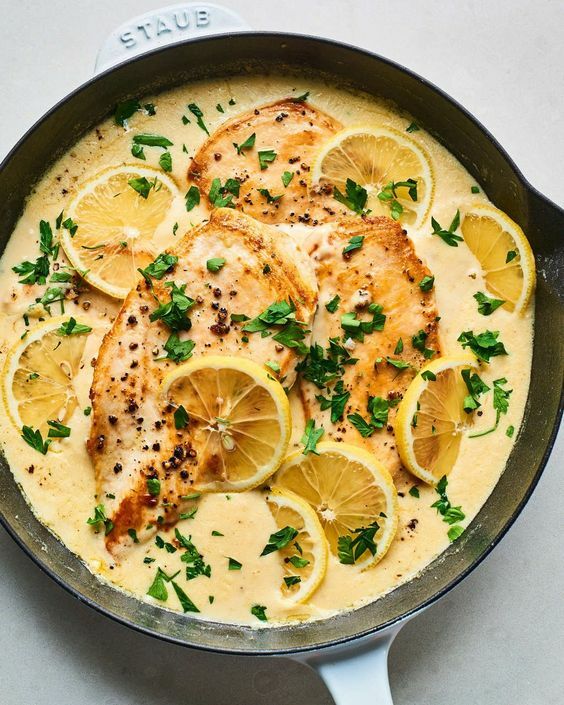 Stir the lemon juice into the sauce. Garnish with the parsley and lemon slices and serve immediately.